We will have so many delicious snacks at the Lauraville Farmers Market tonight from 4-8PM. 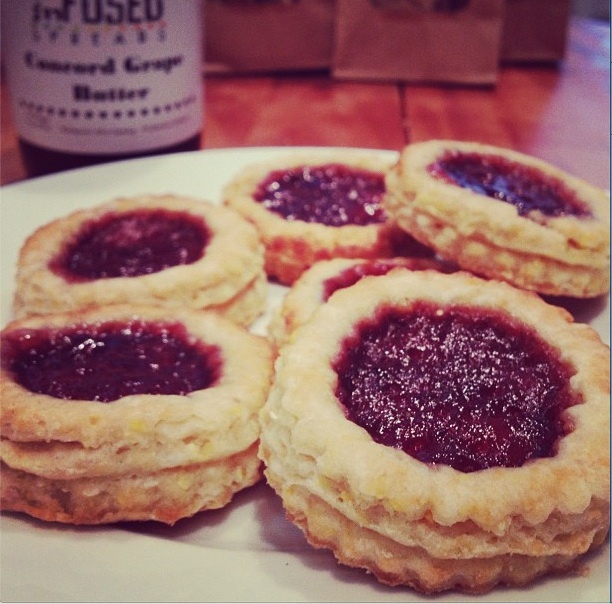 Our snack of the week features Infused Spreads' so-much-better-than-the-classic Concord Grape Jam in our savory jam tarts. We'll also have rich black bean brownies topped with spicy cocoa powder, amazingly chewy cranberry oat cookies, and our spicy and smokey mixed nuts. You can also try some rosemary garlic popcorn or a twist on our classic Baked Cheese Stamps-we roasted some jalapenos and tossed a teeny bit of cumin in the dough! Come out to enjoy the gorgeous fall weather and snack it up tonight!